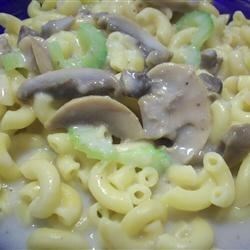 "It's a simple but delightful cream of mushroom sauce served over pasta. This can be used as a side dish or main dish. I came up with it while pregnant and it satisfied my cravings." Bring a saucepan of lightly salted water to a boil. Add pasta, and cook until al dente, about 8 minutes. Drain. In a separate saucepan, stir together the cream of mushroom soup, milk, water and mushrooms. Bring to a simmer, and cook until mushrooms are tender. Mix with cooked macaroni, and serve. My husband really liked the mushrooms in this. He also liked the parmesan cheese on top. This is his rating, since I didn't try the dish. I'm mushroom-ed out. Much too watery. Why add water to this? This was very quick and delicious... I did add a few seasonings to it and cut the milk/water ratio in half so it was more sauce like but other than that, great!